I’m playing with a note taking application for iPad called GoodNotes. It has a lot of potential to help replace notebooks for homework. It requires some customization because the default templates have a beige background. Beige is easier to look at on a bright computer screen, but it is impractical when printing. The built-in solution seems to be to export “notes only”. However, I have mixed feelings about printing handwritten notes from lined paper that has no lines. Here are my customized templates, based on the built-in options, with the background color removed for better printing. When installing these, set margins by 132pt per inch. Thank you so much for providing these templates. I have been printing my notes in grey scale which leaves me without the highlighting and colored pens, this is perfect! I tend to email myself the notes then print it out from my pc. People like you! Thanx a lot! Thanks for these! Would it be possible for you to create a wide-ruled version of the lined paper for all of us who have issues writing with our styii? Yes, I’ll add a couple of variations. I hope that helps! this is Letter paper isnt it? Do you also have them available for the Europeans in DIN A4 paper size? The page size is identical to the iPad screen and does not match any standard paper. You may want to use Adobe Reader to help center or scale the page for printing. I’ll add Letter and A4 size templates to try out. Would it be too much to ask for “Squared” Letter sized? i just want my text to sit on the line everytime!! Thanks so much! These are great!! good work! Will be there a way to get a DIN A4 squared paper format? This would be great, because it might look better if I don’t have to scale the the pages for printing! Hi Lenny, what is the size of your A4 grid? Is it metric? Hey, thanks for reply. I think it’s metric about 5×5 millimeters! What is the size of your grid in the letter size graph paper? Maybe and because of practical issues at the size of actual stylus, a bigger grid size would be better?! 5 mm is a smaller grid than the others. It is added now. Try it out and let me know if a different grid would work better for A4 users. 10 mm perhaps? Hey, thank you so much! It works! Actually it doesn’t matter, because of the zoom function. Sry I got my stylus (adonit jot pro) just 2 days ago and so I’m not very fimiliar up to now with it. The iPad tries to zoom the whole page on the screen, so there might be borders to the left and to the right. But I’m writing with the zoom window, working well! What is the importance of line height in pt, because I tried out different settings not really recognising differences? There is a “new line” button in the zoom window and the line height configures that feature for the template. Thank you so much for the templates. Is it possible to get a blank template in size A4? Hi Maja, I’ve added 4 blank templates in paper sizes. Thank you so much, especially for the European style templates. Would it be too much to ask for A4 squared 5mm and A4 college ruled, both landscape? Hi Kurt, I’ve added the A4 landscape files. Quick and friendly. I’m impressed! Thanks very much for posting these. Any chance of adding isometric projection guideline paper and log graph paper? Hi Stéph, I think the isometric paper can be done easily. Do you use 1/4″ triangles? For log paper, I’ll have to say maybe because it will be a bit of a challenge to make it from scratch. I would also need to know which layout you need? Do you have a sample page? Wow, quick reply! Thanks for that, Robert. I actually live in the metric world, but Goodnotes is a sketching tool, not really for scaled drawings, so 1/4″ isometric will do the trick for me. Good job with the log paper, too. If you get a chance to add a log scale on both axe too,, that would be brilliant – but I don’t want to be too demanding! Okay, I added a log-log version too. The same scale fits about twice on the page width. Is it too big? Good question. What you’ve uploaded will be great for covering a lot of log curves. However, I’m currently working on a report where a line has been plotted over 5 orders of magnitude (1 – 100,000) on the x-axis and a full 9 orders (1 – 10^9) over the y-axis, all plotted onto a portrait A4 sheet. I guess that there would be loads of other potential ranges for other applications, but it would definitely be useful to add one which covers a wide range like this, as well as the narrower, more detailed range you’ve already provided. Second version of log-log added. This one should be similar to the 9-order A4 sheet. A question for anyone who is new to the subject: iPad with retina display settings and should not have different sizes? Hi Luck, all of the templates are based on physical dimensions, just like any PDF file. They are compatible with any screen or printer resolution. Hi! Thank you for the the templates. Is there any chance you could make the 5mm grid in letter size (if possible both orientations) and the college ruled letter size in lanscape orientation? Hi Cocotugo, I’ve added those. Enjoy! Really great job, many thanks. How about some paper with background like lightgreen or other color to protect our sight? Hi Harry, if your device is too bright, all you have to do is adjust the brightness using the Settings app on the home screen. Thanks a lot! For the first time the other day I printed a few notes written on the default templates and found it a bit awful, size being the ipad screen size, colored background you know. Now the feeling of being able to write in templates equivalent to a normal sheet of paper is awesome! this is a fantastic work! Thank you very much for your effort to publish those great templates. Is an A4 engineering paper possible? It is possible. I’m just not sure what it would look like. Could you find or scan an example page? Hi Adam, your request is simply too vague. If you can provide an example or the layout specification then I can give it a try. For the paper size templates, what exactly do you mean by set the margins to 132pt per inch? Is this to be done on the app or on a computer before importing the template? 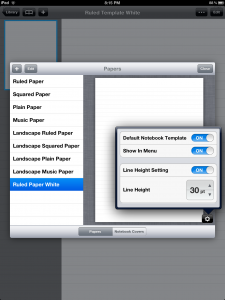 Hi Davis, GoodNotes has a left margin line that you can enable and adjust as you like. I am simply providing the appropriate conversion from “pt” to inches. How do I setup the pdf template on goodnotes version 4? I’ve been using your templates for GoodNotes and they are great! Now that I’m switching to their newer version, GoodNotes4, I can’t seem to figure out how to upload your templates for use. Any ideas? If the new version doesn’t allow me to use your templates, I will have to stick with the older version. Thanks! Thanks a million! Been looking for this for a while! What a helpful website n what a great job you’ve done. I have an ipad mini and used the Graph Paper – 5 mm grid,A4,Landscape, 26pt. thank u, thank u, thank u! you made a great app even better. Very much appreciated!